If you didn't know a number of things about the comics market this past winter, looking at the comics shop market sales estimates for the first quarter would be extremely confusing. By the numbers, for example, fewer comics were shipped in five-shipping-week March, 7.47 million copies, than in either of the four-week months of January and February, for example (7.57 and 7.85 million copies respectively). Yet retailers spent more on comics in March than in either of those two months. That's because -- as you know if you've been reading -- Marvel shipped a significant number of copies to retailers for free in January, while February saw retailers buy three quarters of a million copies of a 25-cent issue of Walking Dead. 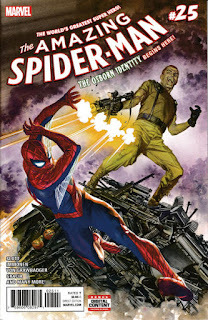 Meanwhile, March's top-ordered comic book, Amazing Spider-Man #25, cost nearly $10! As a result, according to Comichron's analysis of data released this morning by Diamond Comic Distributors, March was the best month of the year thus far, with nearly $45.8 million in comics, graphic novels, and magazines shipping to retailers. That's still a drop from the previous year, but only of 1.68% -- meaning that the year-over-year decline has narrowed to just 3%, or about $4 million dollars ($125.67 million versus $129.58 million last year). And if we skip back to the first quarter of 2014 -- before Star Wars arrived at Marvel and transformed the winter charts dramatically -- we find that the first quarter of 2017 is up 8% in dollars by comparison. It's DC and Image that had the largest declines in new graphic novel releases versus last March. On the comics side, the number of new releases increased, from 488 last March to 536 this March, with Marvel shipping fewer titles and DC, Image, IDW, Dark Horse, and Titan expanding their release slates. That's it for the preliminary analysis of March's sales; a first quarter that, for all the hue and cry heard about it, lands right in the middle of winters over the last twenty-plus years; neither particularly strong or weak. That is, of course, from the 30,000-foot level of aggregate sales -- but when the market's increased in dollar volume five years in a row and book channel graphic novel sales are up 12%, it should take a bit more than a 3% drop in the traditionally smallest quarter of the year to sound the general alarm. A defining feature of the comics market in 21st Century has been its resilience, and there's nothing in the numbers -- as yet -- to suggest that's going away any time soon.